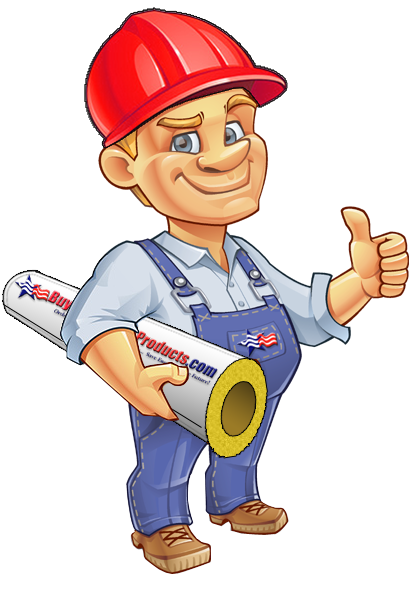 "What thickness fiberglass pipe insulation should I order?" - This is a very common question we receive from our customers. 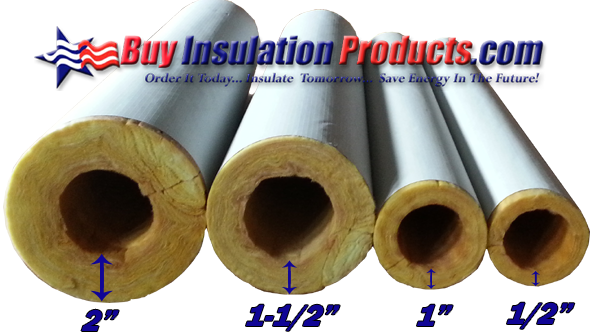 This is also a very good question, because we sell fiberglass pipe insulation from as thin as a half of an inch thick all the way up to two inches thick. The efficiency and the cost of these different thicknesses vary greatly, and it is important to insulate each pipe with the insulation thickness that is the most cost effective. This guide will help you decide on which thickness of our fiberglass pipe insulation is best for your specific application. We have tried to make it as basic and easy to understand as possible. If you have any questions or concerns, please feel free to contact us to discuss your project further. Please note that we break this guide out into two sections, Residential and Commercial. For your own home, there are no thickness requirements so you have more room for personal choice/budget. For our contractors installing our insulation in commercial buildings, there are more minimum thickness requirements if no specification is provided by the engineers. This is by far one of our most popular residential uses of our fiberglass pipe insulation due to the large potential energy savings for homeowners. Having bare uninsulated heating pipes in your home is basically like burning money or flushing money down the drain (whichever way you want to look at it). The fastest and easiest way to reduce your heating costs (besides turning it off!) is insulating all of your heating pipes in your home. It doesn't matter what type of heating system you have, your steam, steam condensate, and hot water heating pipes should all be insulated with fiberglass pipe insulation. In general there are no insulation thickness requirements for residential heating pipes, but we find that a minimum of 1" thickness is cost efficient in most scenarios. In almost every scenario involving a heating pipe, replacing 1/2" thickness pipe insulation with 1" thickness pipe insulation reduces the loss of heat transmission in half. On piping greater than 3" the use of 1-1/2" thickness is also cost efficient. This is your basic hot water pipe running off of your hot water heater. The temperature of these pipes is usually around 104°F to 120°F and by insulating these exposed pipes (unfinished basement/crawlspaces), you can reduce the amount of temperature loss from the Hot Water Heater to the Faucet. By limiting this heat loss, the temperature at the faucet will increase which will allow you to lower the temperature setting on the Hot Water Heater. A decrease in the amount of wasted water can also be noticed in certain situations where the standing hot water retains its temperature eliminating the need for it to be flushed in between uses. For example: After taking the first shower of the morning, the next person who takes a shower 10 minutes later will not have to run the hot water waiting for the water to turn hot. In general there are no insulation thickness requirements for residential domestic hot water pipes, but we find that 1" thickness will greatly reduce the loss of heat transmission. Use of 1-1/2" or 2" thick fiberglass pipe insulation will most likely not be cost effective on domestic hot water unless the size of the pipe is greater than 3"IPS (not common in homes). Cold water pipes should be insulated to prevent the buildup of condensation on the piping when they run through hot and humid spaces. Cold water pipes that have condensation problems can lead to health hazards such as mold and mildew growth in crawlspaces and unfinished basements. The thickness of pipe insulation for most common residential cold water pipes is 1/2" thick. There is usually no additional benefit of adding more than 1/2" thick fiberglass or rubber pipe insulation to cold water piping. When hot or cold water pipes are exposed to the elements the likelihood of these pipes freezing is greatly increased. Refer to our Frozen Pipe Guide for more information on this subject. 1-1/4" to 2" 2-1/2" to 4" Over 5"
Above 350° 250° 2-1/2" 2-1/2" 3" 3-1/2"
251° - 350° 200° 2" 2-1/2" 2-1/2" 3-1/2"
201° - 250° 150° 1-1/2" 1-1/2" 2" 2"
141° - 200° 125° 1-1/2" 1-1/2" 1-1/2" 1-1/2"
105° - 140° 100° 1" 1" 1" 1-1/2"
For domestic hot water systems use 1" thick fiberglass pipe insulation on pipes up to 2"IPS. Use 1-1/2" thick wall on pipes larger than 2" IPS. *Minimum thicknesses to meet ASHRAE 90. 600°F - Pipe sizes up to 12" use 1-1/2" thick, and 2" thick for larger than 12"
800°F - Pipe sizes up to 3" use 2" thick, and 2-1/2" to 3" thick for larger than 3"
110°F 80% 1-1/2" 1-1/2" 1-1/2"
110°F 90% 3-1/2" 3-1/2" 3"
100°F 80% 1-1/2" 1-1/2" 1"
100°F 90% 3-1/2" 3" 2-1/2"
90°F 80% 1-1/2" 1" 1"
90°F 90% 3-1/2" 3" 2-1/2"
80°F 80% 1-1/2" 1" 1"
80°F 90% 3" 2-1/2" 2"
70°F 80% 1" 1" 1"
70°F 90% 2-1/2" 2" 1"